Studio106 provided a professional design service for Auckland Council's Whau Local Board, as part of a long term community development plan. The vision was to reactivate an existing site and turn it into an ‘activity hub’. 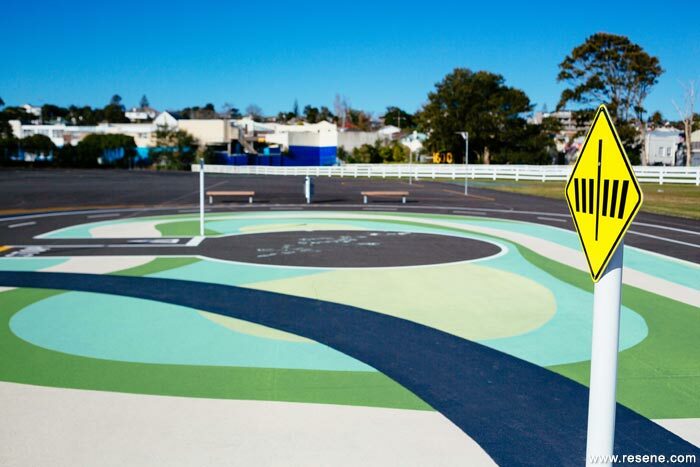 A ‘Learn to Ride’ zone was the first stage for this community development creating a safe and inclusive family environment that provides the chance to connect and socialise within the Avondale community. The idea was to provide multiple areas and zones for passive and formal learning activities. The Learn to Ride project aimed to encourage active modes of play offering a vibrant landscape to improve bike riding skills. 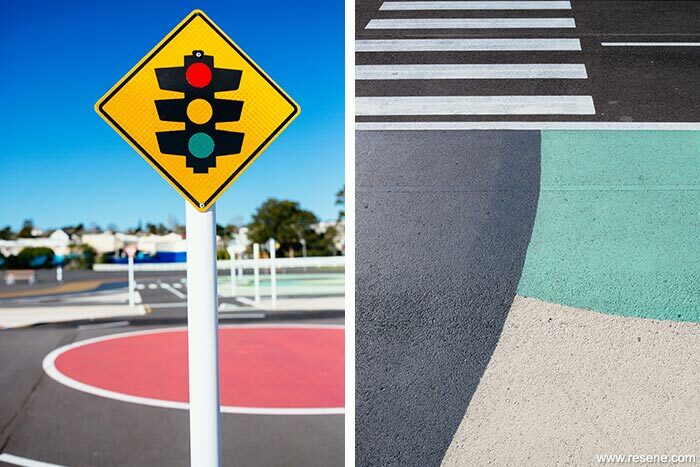 The design focus generates conceptual forms and colour, which derive from the surrounding landscape of Avondale and West Auckland. Street names and areas have been included such as ‘Pt Chevalier’ and ‘Ash Street’. 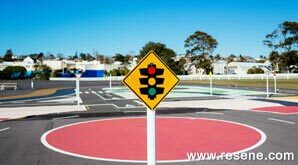 This provided a cue to generate multiple areas and zones for learning activities. Colours are vibrant with interesting patterns activating children’s curiosity. The space is a safe environment that allows people to learn to ride and develop the skills and confidence needed for biking within the city. Colour selections are designed to be contrasting and complementary with different tones to mimic the inspiration cues. Warm tones of reds and oranges reflect the colours of the local community represented by Resene Buttercup (bold yellow orange) and Resene Memphis Belle (fruity red) for vibrancy complemented by Resene Okey Dokey (bread beige) and Resene Sakura (peach blossom pink). The Ash Street Island area references the local Waitakere forests, represented with Resene Chelsea Cucumber (mint green), Resene Bay Leaf (clean green) and Resene Limeade (tangy green) and the addition of Resene Raffia (biscuit beige) as a nod to the ground of the forest. Along the Western Motorway, with its reference to Pt Chevalier, Resene Malibu (surf blue), is used for its vibrancy to denote water. This project demonstrates the power of paint and colour, turning a flat surface into endless hours of edutainment. All colours were painted in Environmental Choice approved Resene Lumbersider waterborne low sheen paint. Learn to Ride won the Resene Total Colour Landscape Award. The judges commented “This project captures the imagination of all ages, while providing a practical space for riders to learn to ride. 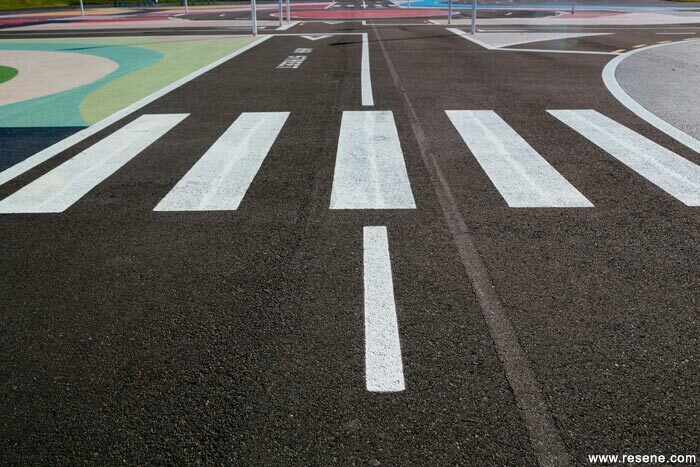 It would have been so easy to simply mark the roads, add patches of green and the job would have been finished. Instead, the colour is implemented with such care that the significant expanse of flat surface has a sense of topography as colours flow together to replicate land contours and water. The placement of colour on this sheer scale makes this project even more challenging with a careful balance needed to ensure that the colour works when viewed up close by riders and at a significant distance as they set their direction.